D Telfer London Ontario Canada said ... I saw one the other night in my neighbour's backyard. I live in a townhouse complex so the population density is very high around here. Was surprised to see one in the city like this. Gerry from Frankford, Ontario, said ... Glenmiller Road at lock 5 on the Trent. Thursday morning in October, 7:15 am. 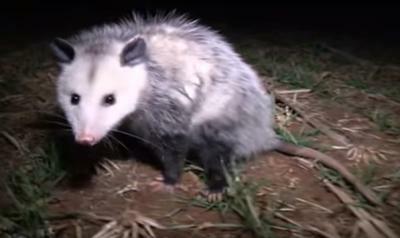 I was walking through my back yard, an adult possum, that appeared to be in great shape. Stopped and had a look at me on my back deck, then disappeared into the hedge. I have lived here 20 years and this is my first sighting, what a treat, we have foxes and coyotes around, I hope they don't get it. October 24, Debbie O'brien from South Etobicoke said ... I live in a 3 story apartment and I live in the basement apartment so my cats go in an out the window and today I went to let my cat in and then I saw the Possum at the end of the front yard..
October 27 Sylvia & Ron from Shallow Lake wrote to say ... Rather than put fish skins in the garbage, we put them out for the neighbour's cat, or so we thought. Using Manything, an older iPhone, and a light, have been monitoring and recording the area. Discovered Possums, a Raccoon, and the cat. Now with our first snowfall, are worrying how the Possums will survive the winter. October 27 a reader from Newmarket said ... Just as it was beginning to get dark following our first snowfall of the year we noticed an unusual visitor trying to find some scattered seeds from under our bird feeder. This shy little guy moved on a few minutes later. Our first Possum sighting was rather exciting and we'll watch out for future visits. Sigrid Essig from Oshawa said ... on October 29 I had a visit in my garden around 9 pm from a little Possum. It came very close to our patio door, it walked around the garden looking for food. October 29 Sharon from Keswick, Ontario, said ... I was outside around 4:30 a.m. and saw one of these guys going through my backyard. I didn't know what it was till I googled it. I have never seen one before. He wasn't a fast mover, just took his time. Also in November, Bill reported ... caught on camera in Erin Mills area in Mississauga. To find out what was burrowing under our garden shed, we set up a CCTV camera and found our side yard is a passageway after midnight for skunks, rabbits and an Opossum. It casually wanders around the backyard, munching on food of some sort in the grass. Sudden floodlights on a motion detector, don't seem to bother the animals. Occasionally one or two Coyotes travel along the trail behind our house, but only rarely. On November 9th, Mary Anne from Oshawa wrote ... I first saw one running across my street one evening this spring when I was returning home after being out. Later in early July I was walking our dogs through the green belt in our neighborhood and we came across a baby Possum that appeared to be dead on the path in through the woods. Since then I have seen numerous ones! Marlene Dixon of Pickering said ... I pulled into my driveway this evening while chatting (hands free) with my son from Edmonton. I saw this creature with a long nose and tail walk up between the houses. I couldn't imagine what I was seeing. I sat in the car and continued to chat on the phone. Our little friend emerged and I knew he was a Possum. I tried to catch a picture but he slipped away into the night. I hope he survives our cold winter.